Hon. Richard Stokes, Superior Court, Sussex County: Judge Richard Stokes has been serving on the Superior Court of the State of Delaware since 1999. He has been nominated for appointment to the position of Resident Judge. Hon. Mark Buckworth, Family Court, New Castle County: Judge Mark Buckworth has been serving on the Family Court of the State of Delaware since 1994. He has been nominated for reappointment to his position. Hon. Bradley Manning, Court of Common Pleas, New Castle County: Bradley Manning is currently a Commissioner on the Superior Court of the State of Delaware, where he presides over a wide variety of civil and criminal matters and over several specialty treatment courts. 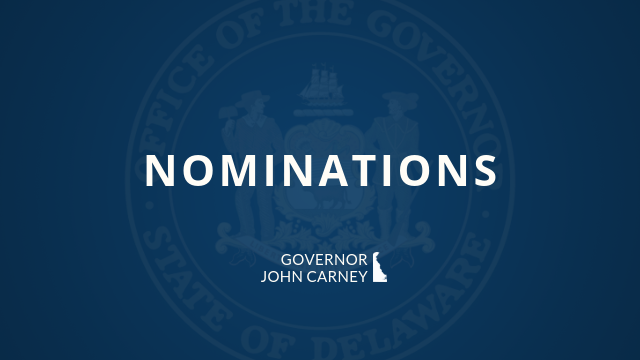 Before joining the Superior Court, Commissioner Manning worked as an Assistant Public Defender for the State of Delaware and served in the United States Army, during which he was deployed in two separate missions, and attained the rank of Captain. Craig Karsnitz, Superior Court, Sussex County: Craig Karsnitz is a Partner in the Litigation and Trial Practice Section of Young Conaway Stargatt & Taylor, LLP, where he has for forty years litigated in all of Delaware’s courts, principally in the Superior Court. Prior to his time at Young Conaway Stargatt & Taylor, LLP, Karsnitz was a law clerk for The Honorable John J. McNeilly on the Delaware Supreme Court.